At the Researchers in Fundraising Conference, 25th November 2016, I promised a list of the sources I mentioned. Here it is. Abstract Annual rich list published by Swiss business and economics magazine. Abstract Annual survey of salaries of company directors in quoted companies in Spain. Shows breakdown of average salaries, and is useful for estimating income. Abstract Directory of foundations in the Netherlands, including information on 737 foundations. €49.50 price. Abstract Lifestyle magazine aimed at HNWIs in the Netherlands. Includes some profile interviews, and occasional features on philanthropy. Abstract Business website and magazine for Luxembourg. Publish an annual “Paperjam Guide” including a business directory and biographies of company leaders. Abstract Spanish Government website showing structure, funcion, curricula and salaries of top civil servants. Abstract Listing of ANBI including foundations in the Netherlands, following the transparency law. Searchable by foundation name. How Philanthropy is Changing in Europe. Abstract There is a new age of philanthropy in Europe – a €50 billion plus financial market. Changing attitudes to wealth, growing social need and innovations in finance are creating a revolution in how we give, aided and sometimes abetted by governments. Mapping the changes, Christopher Carnie focuses on high-value philanthropists – people and foundations as ‘major donors’ – investing or donating €25,000 upwards. It will take a researcher to wake up the fundraising community. Because it is time to wake up your fundraising colleagues to a new reality in philanthropy. A reality that is working its way through many of your major donors, your trust donors, your finance sector and bank donors, and even your government grants programme. This is not some insidious virus, although it could eventually cause the extinction of some organisations. Its effects are dramatic on the organisations and people it touches, showing then a new reality, new priorities and a new and different way of reaching their goals. This is Venture Philanthropy and Social Impact Investment (VP/SI), the subject of last week’s EVPA conference in Paris. The conference confirmed the coming of age of VP/SI, with a mix of leading foundations, banks, philanthropists and a growing band of intermediaries working in the “financial ecosystem” around this mix of investment and philanthropy. The banks and advisors are very excited by this new market. They like the mixture of social change and financial tools, and they are building teams to help their HNWI and UHNWI clients work in this area; I met a seven-person team from one French bank including account managers, due diligence staff and social investment experts. Welcome to your newest competitors. They are well-resourced, hungry for new business, have loads of great customer relationship data, and have a dizzyingly good contact book. Your HNWI and UHNWI donors and prospects, along with trusts and foundations that you work with, are being courted now, by the banks. If your fundraising colleagues are not aware of this trend then maybe it’s time for you to give them a wake-up call. Doing that could be easier than you think. One of the remarkable (at least in Europe) characteristics of this market is its transparency. I chaired a session on failures in philanthropic investments, and 50 people in the room ‘fessed up to one or other bad decision, and then shared the leanings from their failure. For prospect researchers the new transparency means that there is an increasing volume of well-researched information on the sector. Start with the EVPA website, where there are high-quality research reports, and a full list of members (Factary is an Associate Member). Then check the HNWl offerings of banks such as JP Morgan, Credit Suisse or Rabobank. Next take a look at foundations operating in this space. Esmée Fairbain Foundation or Impetus /PEF in the UK, Fondazione CRT and Fondazione Cariplo in Italy, Noaber in the Netherlands… The list is growing, and in Europe alone EVPA has 200 members. In Asia the growth is even faster and EVPA’s sister there, AVPN now has 300 members. Then look at how organisations, many of them small social change non-profits, have taken up the challenge of working with these demanding but exciting investors. The EVPA website includes case studies and examples. Check out Factary’s reports on the sector. And finally talk to your colleagues. Tell them that there is a significant new movement in high-value philanthropy. It’s a movement of people who want to invest, not give. Who want to participate, truly participate, in your work; these people do not want a packaged project on a gilt plate. Tell them that in the view of many VPs, traditional fundraising is a costly, inefficient way of winning funds. And tell them that this will take time but that it could transform your organisation and, more importantly, transform the lives of the people you work with. But do, please, tell them. Because no-one else is. Amongst the 500 delegates at the EVPA conference I counted just three fundraisers. Three! In a hall full of philanthropists. Your research could help your colleague to be number four. Do it, now. 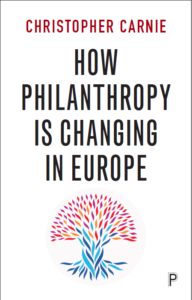 Chris Carnie’s latest book – How Philanthropy is Changing in Europe – is to be published in January 2017 by Policy Press: pre-order your copy here!